Welcome to my personal website. This tells you the story of an ordinary boy from a South Yorkshire mining Town, educated at a local comprehensive School, brought up by a single parent Mum who struggled with dyslexia but who became a FTSE Executive Director, Chief Executive, founded a University and became a Professor. Anything is achievable if you put your mind to it! I am Professor Carl Lygo, Professor of English Common Law and a qualified Barrister having practised on the Northern, North Eastern and South Eastern circuits. I am now concentrating on working with organisations that seek to extend opportunities for all in society and offer disruptive strategies to widen access. 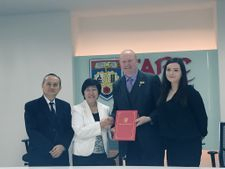 I do this in my new role as the Vice Chancellor and Chief Executive of Arden University, a ground-breaking UK private University committed to extending access to higher education. I am also the Chairman of the ownership board of the University of Applied Sciences Europe, which is based in Germany at Iserlohn, Berlin and Hamburg. I am also currently the Chairman of a Multi Academy Trust called Turner Schools (a Charity that I co-founded and based in Kent to help disadvantaged pupils), an advisory board member of the Higher Education Policy Institute (HEPI), WONKHE (the home for policy wonks interested in Higher Education) and UCFB (University Campus of Football Business). I was also the founding non-executive board member of the Office for Students, the new independent regulator of Higher Education in England. 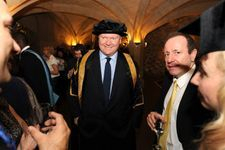 For 20 years I was at BPP Professional Education (best known for educating Accountants and Lawyers), where I rose from the "shop floor" of being a tutor to become its 3rd ever Chief Executive Officer and I founded BPP University, becoming its first Vice Chancellor. When I left BPP in March 2017 it consisted of a Business School, Law School, School of Health and the School of Foundation & English Language Studies. We had just celebrated our 100,000th alumni in BPP University. BPP had locations all over England, sold its text books in 186 countries and operated in 56 countries with 3,000 staff based around the world. I was fortunate to lead BPP through 2 sales, a delisting from the London Stock Exchange (BPP was a FTSE 250 company at the time and I was the longest serving plc board director) and the sale/merger/acquisition of 6 major subsidiaries (including 2 international subsidiaries). I have led significant change programmes and developed award winning strategies for success. I was blessed to have attracted exceptional people to BPP who did amazing work. My area of expertise is professional education and I have a wealth of almost 30 years involvement in the education and training of professionals. Given my personal background I am committed to widening opportunities to those from diverse backgrounds. I hope my website might help others who are on a similar journey. This website gives you information about my background from my early education and qualificaiton at the Bar (early years), to my career in education, some details about my family life, my interests (which you can see I don't take myself too seriously) and links to interviews that I have given. 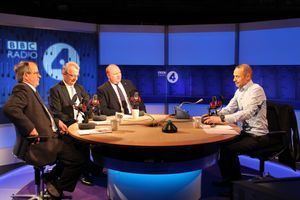 An appearance on Radio 4 with Evan Davis discussing the "Business of Education" on the popular radio series 'The Bottom Line". Here is a link to the programme. An appearance on Radio 5 Live with Declan Curry discussing "University Challenges" with Professor Alison Woold, Nicola Dandridge (CEO UUK who would go on to be the CEO of the Office for Students), and Simon Nelson (CEO Future Learn). Here is a link to the programme.